Allston Diner serves up breakfast (and lunch) with the kind of retro kitsch and a punk flair you can only find in Allston. Cartoons play on the TV, children’s book illustrations decorate the tables, a huge collection of decorative salt and pepper shakers line the booths, and the staff sport tattoos, piercings, colored hair and black band t-shirts. Even with the wild décor the food reigns supreme at this fast-service joint. And carnivores and those who prefer plant-based diets can take pleasure in the wide variety of Southern-style choices. The Ultimate Vegan Breakfast offers tofu scramble 'omelets,' with your choice of fillings and Daiya vegan cheese, a side of soy sausage or the homemade BBQ seitan, and collard greens or home fried potatoes. On the sweet side, pancakes are available made vegan and topped with fresh fruit. Meat-eaters have even more options. The Litchfield 33 is an omelet that features tender house-made beef brisket with aged cheddar, barbecue sauce and collard greens. And their savory cornbread waffles topped with fried chicken and a generous pour of meaty gravy are always a hit. But it's the Diner's biscuits and gravy that are a rare find in Boston. 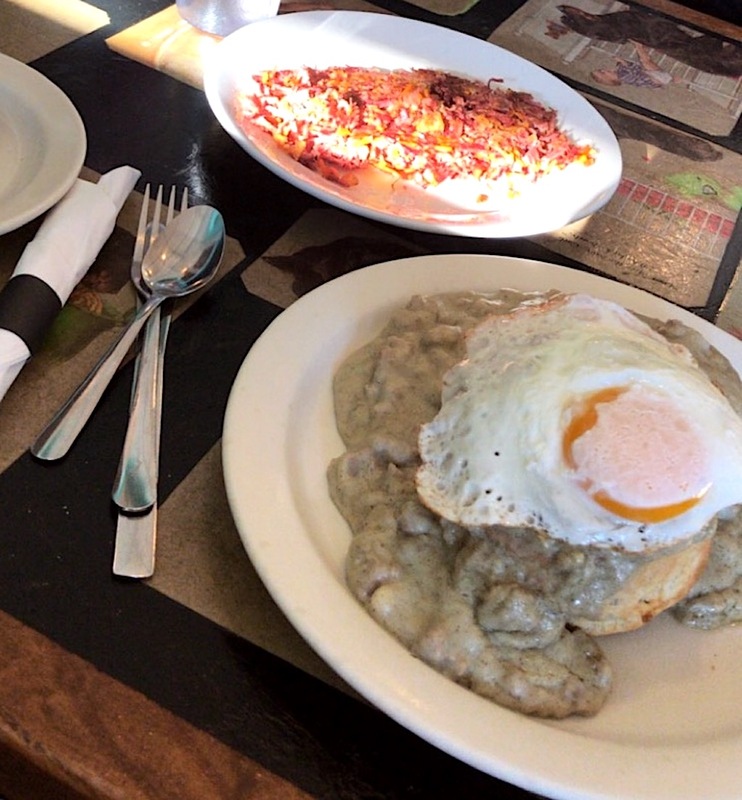 The dish comes with two huge house-made biscuits covered in your choice of a rich sausage or bacon gravy. Top it off with an egg prepared the way you like it and you'll find yourself in Southern-comfort heaven. 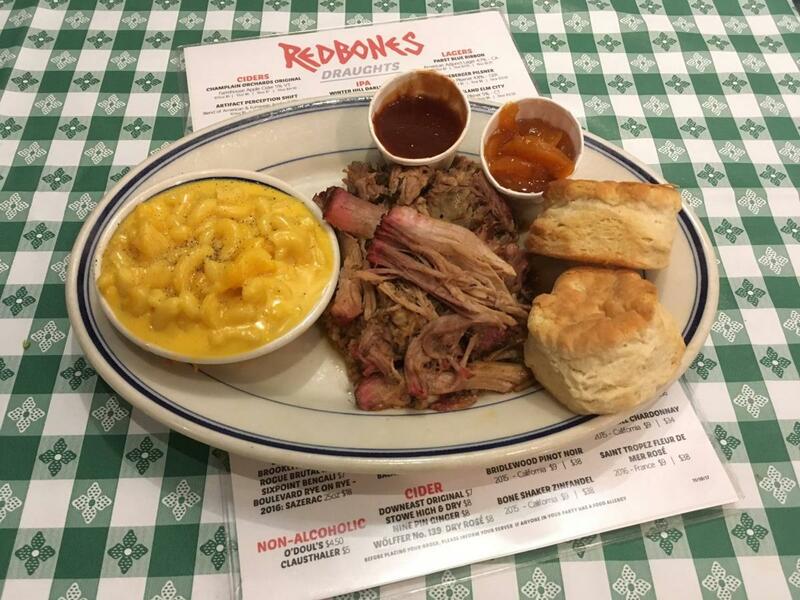 Redbones has been serving barbecue in Somerville for over 30 years. When it comes to decor, the classic spot keeps it simple and pairs their top notch BBQ with a wide selection of craft beers, many locally made. The pulled pork is dry rubbed and slow smoked, and served with your choice of hot or sweet barbecue sauce at the table. It pairs well with the mac and cheese, which is bright yellow, and chock full of real cheese. But it's the classic fried chicken dinner that makes for the real classic comfort food meal. Crispy fried chicken is piled onto the plate and served with your choice of sides. We like the fried okra, mashed potatoes and gravy, and biscuits with homemade peach jam. Delicious! Pace yourself with the huge portions at Redbones and be sure to save room for dessert. The banana pudding made with vanilla wafers, and the Honey Chess Pie are authentic Southern comfort at its finest. And it's the Texas chocolate sheet cake that's a personal favorite. No barbecue meal is complete without the rich frosted cake topped with a high swirl of fresh whipped cream. The original Rosebud Diner was built in 1941. Under new ownership, the diner was upgraded into a large modern restaurant, and rebranded as the Rosebud American Kitchen & Bar in 2013. Rosebud still maintains the classic diner car façade and its spot on the National Register of Historic Places. Much like their historic building, the approach to food at Rosebud is classic comfort with modern upgrades. The BBQ Baconator Meatloaf Fatty is not your mother’s meatloaf. Covered in spicy poblano-onion gravy and served with hearty, skin-on mashed red potatoes, it’s a flavorful update to the classic diner staple. Rosebud specializes in cocktails as well, with a particularly rich selection of boozy milkshakes. Many come topped off with a snack, making them more than hearty enough to fill in as dessert. The Blueberry Bourbon Milkshake is served with a wedge of Belgian waffle and a drizzle of Vermont maple syrup. Insane. But Rosebud’s real claim to fame is their pies. 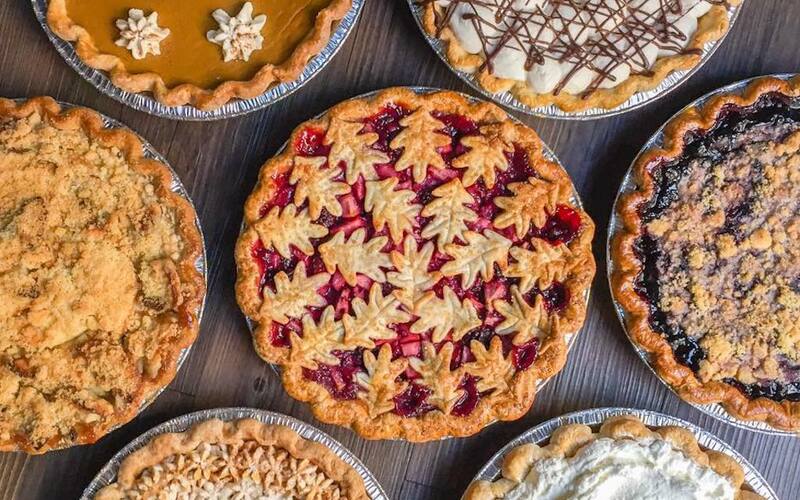 Featured in our list of the **Best Places to Get Pie in Boston**, Rosebud rotates seasonal favorites alongside five classics that are always available and always delicious: key lime, black bottom, dutch apple, chess, and peanut butter fudge. Available as a slice to finish your meal or whole to wow your guests for special occasions. B3, short for Back Bay Beats, is a new restaurant inside of the main tower building at Berklee College of Music. Through a partnership with the music school, B3 hosts live music seven days a week, featuring students, alumni, and visiting artists. The philosophy at B3 is a commitment to “the pleasures of simple food and great music,” and they certainly deliver on both fronts. The music is varied, offering traditional music from the American South, gospel, R&B, funk, world, jazz and more. The cuisine is Southern, with a modern approach and multicultural influences. The weekend brunch menu is stacked with Southern-comfort classics, including some that are difficult to find in these parts. The shrimp and grits are rich and delicious, and start with stone ground cheesy grits, piled high with creole seared head-on shrimp, sundried tomatoes, Tasso ham, and crispy wild mushrooms, finished off with white wine butter sauce. The B3 poutine, traditionally a Canadian dish, fits into the Southern-comfort category. Hare and-cut French fries smothered in rich southern flavors created with neck bone chicken gravy, crispy pork belly, mozzarella cheese curds, and thyme oil. But it's the ham biscuits that are to die for. B3 uses their own buttermilk biscuits, slow cured country ham, house-made pimento cheese, and a drizzle of Tabasco-infused honey for the traditional New Year's treat. You won't forget this dish. 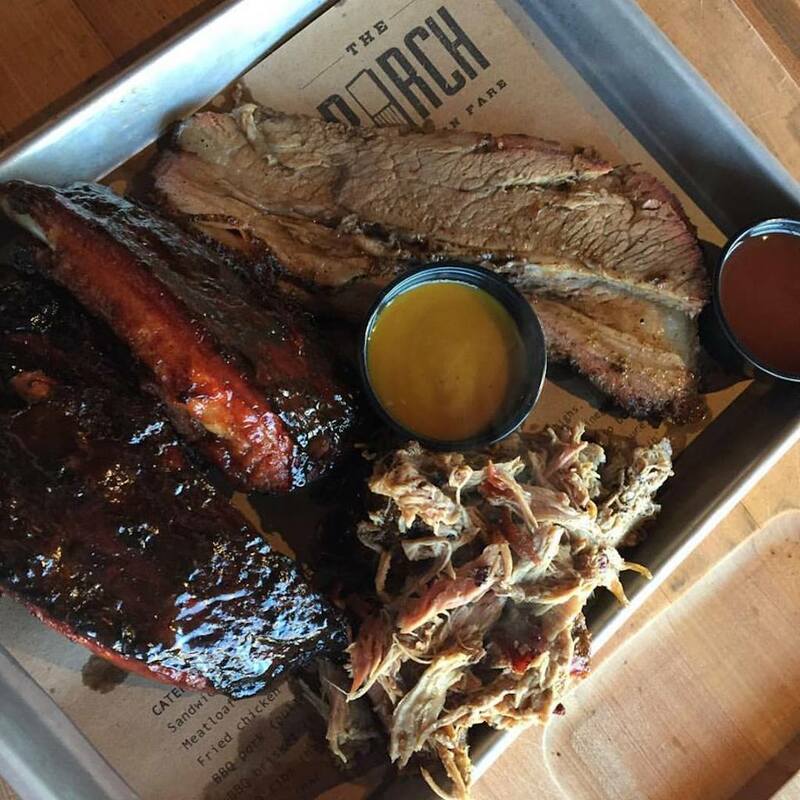 The Porch in Wakefield serves up traditional barbecue from across the South, with a twist. The Hot Brown, an iconic Louisville, KY dish, is an open-faced sandwich, with smoked turkey breast, tomatoes and smoked pork belly, all covered in cheesy Mornay sauce. For vegetarians, the Nola is an oyster mushroom Po Boy, loaded up with pickles, shredded lettuce, and remoulade sauce on crunchy French bread. But the real star at The Porch is their smoked meats. The outdoor smoker is burning wood year round, infusing the briskets and racks of ribs with pur smoke flavor. We suggest trying the BBQ Sampler, with pulled pork, pork ribs, and beef brisket all on one glorious tray.